Chautauqua editors Jill and Philip Gerard actively solicit writing that expresses the values of Chautauqua Institution broadly construed: a sense of inquiry into questions of personal, social, political, spiritual, and aesthetic importance, regardless of genre. 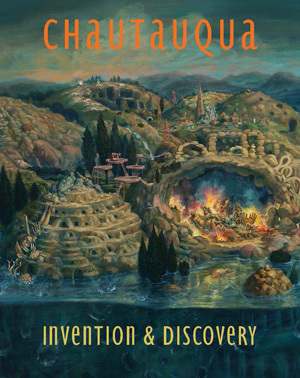 Chautauqua (published annually in June) considers the work of any writer, whether or not affiliated with Chautauqua Institution, except for members of the Board of the Chautauqua Writers' Center unless solicited for special issues. The original Chautauqua, founded in New York state, inspired a national movement that included traveling tent shows imitating the programs presented at Chautauqua. These shows brought theater, opera, classical music, art, theological debate, and literature to the hinterlands all across America. Over the years, the literary arts became a prominent focus, culminating in the Chautauqua Writers' Center. Congratulations to Diana Hume George for her notable mention for her essay "On Denying Denial, A Meditation" from Chautauqua, No. 9 in Best American Essays 2013!